Creative, spiritual, passionate, generous, introspective and wildly interesting…this is Kendal at Oberlin resident and artist, Bob Cothran. In the 5+ years he has lived at Kendal, Bob has created a wall-sized set to camouflage and delight, while the extensive renovation of the Langston dining space was in progress. Sets for the Strawberry Fields Opera, which opened in the Kendal Auditorium, were designed and constructed by Bob. 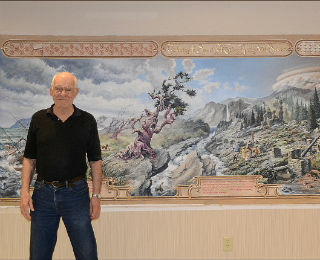 After four years, he recently completed painting an intricately detailed three panel mural, which graces the walls outside the Fox and Fell dining room (you truly have to see it to believe it!). 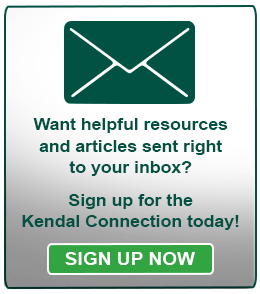 In addition he has created sets and backgrounds for Kendal’s annual Spring Fling and Solstice celebrations. It would be reasonable to think Bob Cothran, at 85, might consider a respite after completing this enormous recent project. No…this artist takes such pleasure in his vocation, he doesn’t consider it work. It is life. About half way through the mural project, another scheme began taking form in Bob’s mind. He said it is complex, pretentious and impossible in scale, yet the vision continues to occupy his thoughts. While Bob finds it challenging to describe, he has decided that the answer is to paint it. The project is a polyptych, a painting (usually a panel painting) divided into sections or panels. Polyptychs typically display a main panel, with side or wing panels hinged together. These were most commonly created by early Renaissance painters, most of whom designed their works to be altar pieces in churches and cathedrals and today in museums. Bob’s new project borrows the style of the polyptych, but different in that there will be nine panels 12 ½ ft. wide x 11ft. high surrounded by elaborately ornamented carved frames. The framing not only separates each panel, but is part of the content and meaning and appears to be three dimensional. Images in the paintings will be religious subjects. Bob shared that, in this new project he is trying to express that those wonderful bible stories are not ultimate reality, but a vast masterpiece of metaphor. He continued that his execution is in a sense using forms as a language commenting on the content. The research, technical and physical organization for this enormous project has begun and by late fall Bob expects to be working again in Kendal’s craft room. He anticipates that the project will take 4-6 years to complete. Plan your visit to Kendal at Oberlin today and be sure to see Bob Cothran’s mural in front of the Fox & Fell Dining Room.